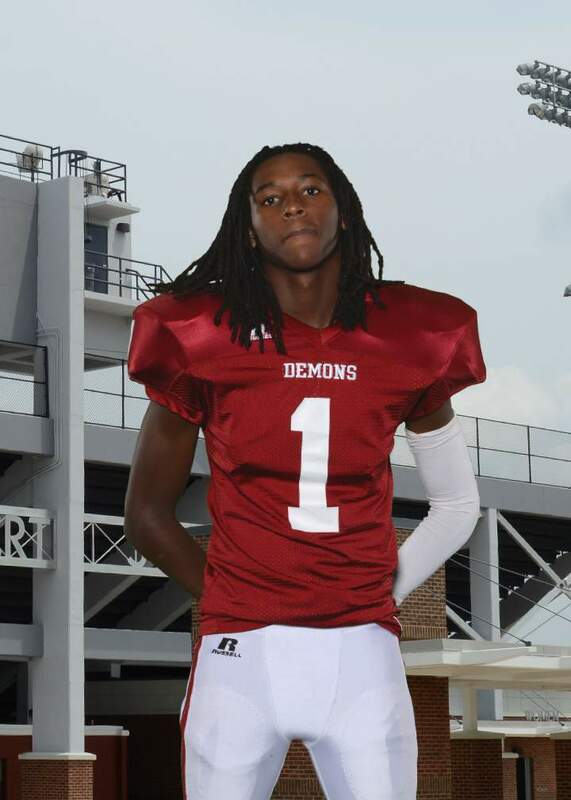 ***EXCLUSIVE*** Interview with Elite 4-Star ATH Marquez Callaway: Where do the Dawgs stand? Check out his highlights HERE. Marquez Callaway is an elite athlete in the class of 2016. I said back in the fall that Callaway would without a doubt be ranked in the top-100 once 2015 rolled around, and sure enough, that’s where he sits on Rivals, 247 Sports, and ESPN. He has the skills to play wide receiver or defensive back for pretty much any school, but I really see him playing receiver at the next level. Marquez can go up and get the ball as well as any receiver I’ve seen in this 2016 class. He also possesses tremendous speed (sub 4.5), and great vision when he has the ball in his hands. He is certainly a player to keep an eye on throughout the next year, and one I fully expect the Dawgs to make a main priority. Monday night, I had a chance to catch up with Marquez and get the inside scoop on where things stand with his recruitment. First off, let me say that I left my conversation with Marquez very impressed. He has a good head on his shoulder, and you can tell immediately that he is a very polite, very humble young man. Whichever school lands him will not only be getting a great talent, but also a tremendous individual. Johnny Sanders: I know you don’t have a firm leader yet, but could you tell me what teams you have at the top of your list? JS: Where is Georgia telling you that they’d like you to play? Callaway: They want me to play safety for them, but they told me that if I wanted to play receiver, I can play receiver. JS: Do you have a feeling of what position you would like to play? Callaway: Yeah, I want to play receiver. JS: You mentioned Auburn as one of your top schools. What would you say stands out about the Tigers? Callaway: I have a good friend, Jeff Whitaker, that went to Auburn and played, and he told me lots of things about the school, and now that I’ve looked at the school, I see that everything he told me was right. So, I know if he says it’s a great school, it’s a great school. JS: What would you say stands out about Georgia? Callaway: The location. It’s not too far from home, and all the coaches seem like they have great personalities. I really like the people there. JS: What are going to be the biggest factors for you when you make your decision? Callaway: I think that it’s going to come down to if we’re all on the same page. Like, if they respect what I want, and I’m going to respect wherever I go. So, it’s going to come down to whether or not they’re going to respect me for me. JS: What coaches are recruiting you right now for Georgia? Callaway: Coach Lilly and Coach Richt both talk to me. JS: I guess you’ve seen the news now about Coach McClendon becoming the receivers coach and Coach Brown coming in to coach the running backs. Have you gotten a chance to meet Coach McClendon or talk to him? Callaway: No, I haven’t met him yet. But I plan on it. JS: What about Georgia do you like outside of football? Callaway: This past year, I had a couple of good friends that graduated from my high school, and they’re attending UGA now. They tell me how fun it is outside of football and how they all have a good time. JS: Do you have any friends on the football team at Georgia or anyone that’s coming in? Callaway: I don’t know anyone on the team, but I have a good friend, Rashad [Roundtree] who’s going there next year. JS: What school do your parents like best so far? Callaway: To be honest, I think my mom likes Auburn and Georgia, but I don’t know about my dad. He just goes along with her. JS: With the major need that UGA has for wide receivers and defensive backs, will that affect you at all knowing that there’s a good chance you can come in and play early? Callaway: That’s going to be my main question I’m going to ask them, so I can find out if they’re really going to play me. JS: You mentioned that you want to play receiver, and obviously the big talent that is going to attract guys to Georgia for the next couple of years is quarterback, Jacob Eason. Is he factoring into your decision at all, and do you ever talk to him? Callaway: I met him one time at a camp we were at together, the Under Armour All-American camp, and I didn’t really talk to him. I just saw him, and he saw me, but he probably didn’t really notice anything about me, and I didn’t notice anything about him, so we just kept the distance. JS: Have you been in contact with him at all? Callaway: Oh, no. I don’t think he knows me. JS: What did you think after watching his film? Callaway: I wish he could throw to me. JS: Some quick hits: Who has the nicest facilities? JS: The best game environment? Callaway: Probably Florida when they played LSU. JS: The best college town? JS: When are you planning on getting down to Athens next? Callaway: I’m not quite sure. I’m going to try to make it to some junior days, but we’re still in basketball season. We made it to the state playoffs. So we have some basketball games on some of the junior days. I do plan on being at Georgia in the summer for Dawg Night. JS: Do you have a date set that you want to commit? Or do you know when you at least want to narrow down your list? Callaway: I’m probably going to drag it out to signing day. I haven’t visited all the colleges I want to, but after I visit all the ones I want to, I’ll probably narrow my list down. JS: Where would you say Georgia’s chances are compared to other schools? Check back for more recruiting updates! Posted on February 18, 2015, in ACC, Auburn, Blog, Florida State, General Sports, Georgia Bulldogs, Notre Dame, Recruiting, SEC, South Carolina Gamecocks, Tennessee. Bookmark the permalink. Leave a comment.